It's a little old now, but with the release of a new 30" model from Dell we also wanted to take a look at the previous model. This was so that we could carry out a direct comparison with the new model, which we completed as part of our U3011 review. We also wanted to provide a full review of the 3008WFP separately as the price of the unit is sure to drop now that a new model is available, and users may still want to pick up the 3008WFP second hand. In fact the 3008WFP isn't that different to the U3011 in terms of features, functions and specs so it is still worth a look if you can find one at a good price. This model was released a couple of years ago, but has long been a popular and affordable option in the 30" space. The 3008WFP has an attractive design in my opinion, with a brushed silver coloured metal bezel around the panel. This is 25mm thick around the right and left hand sides, but a little thicker at 30mm at the top and bottom. The screen size is very large of course at 30", and takes some getting used to even if you are familiar with 24 - 27" sized screens. The stand and base are a glossy black colour and although made of plastic they do offer a sturdy construction to support the heavy 10.7Kg screen. Materials are of the usual high quality you would expect from a high end Dell screen. The panel itself features a matte Anti Glare (AG) coating as opposed to any glossy solution. The panel actually sits a little bit back from the front of the bezel by about 5mm which is a little deeper than on most screens. The coating was very similar to that on the U2410, U2711 and U3011, but I personally didn't find any serious problems with it being too grainy or anything, and it was also very similar to the S-PVA based Dell 2405FPW. The graininess is more apparent on white and lighter backgrounds. I know some users don't like the feel of the coating or prefer glossy solutions, so if you're worried try and see one of Dell's current range in action in person. I know there's been a lot of complaints about the graininess already but it's all down to personal taste so I won't labour the point. The back of the screen is darker silver metal on the most part, with black mesh grills to allow heat disipation from the screen. The whole screen is nicely enclosed, with rounded edges and a sleek feel. All in all, the 3008WFP looks very attractive and professional I think. The base is different to that used on the newer screens, and different to the older 2408WFP model as well which was released at a similar time to this screen. Other than the base, the rest of the stand is also unlike that used on other Dell screens we have tested. The top of the stand features a pretty unique cantilever arm with an attractive silver finish. This allows you to easily and simply adjust the height and tilt of the screen. Movements were smooth with these adjustments, and the side to side swivel offered by the base was also very good. Due to the size of the screen, there was a bit of a wobble from the panel but this was not too bad. There is no rotation feature here to switch between landscape and portrait mode, but at this screen size it's not really that practical anyway. On the left hand side of the screen there is quick access to two USB 2.0 ports and the 9-in-2 card reader. I like the availability of USB and a card reader on Dell's models personally as I find them very useful in day to day office work. At the back of the stand you can see the cable tidy. You have to thread the cables through the actual stand, which is hollow inside. This can be a little tricky where cables have large attachment ends, but once they are through they are kept very nicely out of the way. The power supply is internal, so you only need a normal kettle lead to power the screen. At the back, the underside of the screen features a very wide range of interface options. These are all shown above, but of particular note are the two Dual-link DVI interfaces, DisplayPort and HDMI. Dell have again pulled out all the stops to provide a wealth of connections to suit any user. Always great to see. Since the screen offers a massive 2560 x 1600 resolution, you will need to use a graphics card with a Dual-link DVI output. The screen is packaged with a DL-DVI cable though. The bottom right hand corner of the screen features the OSD control buttons. There is quick access here to input selection and brightness / contrast. There are actual buttons to press here unlike the touch sensitive "buttons" on the modern U2410, U2711 and U3011 screens. The power LED glows green during normal operation and orange in standby and is unobtrusive. The menu itself is reasonably comprehensive, although it is the old software and different to the U-series screens (as I'm going to refer to the U2410, U2711 and U3011 as for simplicity). I found the newer style menus to be very intuitive and easy to navigate, but this older style menu took a little bit longer to get used to. The 'preset modes' sub-menu holds a selection of preset modes which are available, including custom (where you can manually alter the RGB channels for calibration), along with Adobe RGB and sRGB emulation modes which we will test later on. The 'display settings' menu offers control over the hardware level aspect ratio control with options for 1:1 pixel mapping, aspect retention and filling the whole screen. You can also turn the dynamic contrast ratio control on and off in this menu. We tested this ourselves and found that out of the box the screen used 134.2W of power. This was reduced to 97.9W after calibrated (see calibration section) since we had reduced the OSD brightness control. In standby, the screens power consumption seemed to fluctuate between 3.0 and 8.2W. The screen did become very warm at the top on the back of the display, but nothing too bad. There was a very faint buzzing from the screen when up close. 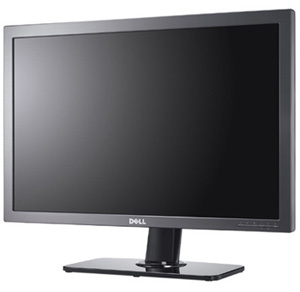 The Dell 3008WFP utilises an 8-bit H-IPS panel, capable of producing 16.7 million colours. The panel itself (LG.Display's LM300WQ5-STA1) is a little different to that used in the new U3011 since this is a traditional 8-bit panel. The newer revision of the panel used in the U3011 is 10-bit (8-bit + AFRC) offering a 1.07 billion colour depth. This would require a true 10-bit workflow and full end to end journey to really take advantage of though, so its use is debatable at the moment. An important thing to consider for most users is how a screen will perform out of the box and with some basic manual adjustments. Since most users won't have access to hardware colorimeter tools, it is important to understand how the screen is going to perform in terms of colour accuracy for the average user. I restored my graphics card to default settings and set it to its standard profile. The U3011 was tested at default factory settings using the DVI interface, and analysed using LaCie's Blue Eye Pro colorimeter and their accompanying software suite. The default settings of the screen were far from ideal really. The CIE diagram confirms the screen is extended gamut as we know from the specs, with the triangle representing the screen stretching a long way beyond the reference sRGB space (orange triangle). Unfortunately gamma was poorly set up out of the box, being recorded at 1.7 here. Colour temperature was reasonable at 6911k, only 6% out from our target of 6500k. Luminance was far too high at 197 cd/m2, and the screen did feel uncomfortable to the naked eye. We had seen a similar story from the U3011 in terms of default luminance, although the gamma was better set up from the factory which is important. Black depth was recorded at 0.29 cd/m2 giving us a static contrast ratio of 681:1 which was moderate for an IPS panel. On the right hand side, the colour accuracy validation was very poor unfortunately. The screen had not been corrected in the factory at all by the look of things. Average dE was 6.5, ranging up to 11.3 maximum. LaCie would classify colour accuracy to be very poor here. We had seen such promising performance from the U3011 out of the box (dE average 1.7) that this was a bit of a shame. Dell have obviously invested more time and money in correcting the gamma and colours on the new U3011 than they had with the previous model. You will need to carry out calibration of the screen here, and may well need a hardware colorimeter to achieve decent useable settings. I changed the screen to the Adobe RGB preset mode which is designed to emulate the Adobe RGB colour space more accurately. Unlike the U3011 though, the 3008WFP is not factory calibrated in this or the sRGB preset modes. As such there are no calibration reports provided as there are with the newer model, and you can expect some less satisfactory results. In terms of meeting the targets, the only real improvement was in colour temperature, which was recorded at 6305k and only 3% out from 6500k. Gamma remained poorly adjusted at 1.6. Factory calibration of the Adobe RGB and sRGB presets was introduced in the 2010 - 11 series of Dell screens (U2410, U2711, U3011) but it is not present here. Contrast ratio was improved a little as well to 763:1. Colour accuracy remained very poor with average dE of 9.0 now, maximum of 16.4. You would again need to calibrate the screen properly for any colour critical work, although I'm not sure this Adobe RGB preset really offers any advantages when working with the Adobe RGB colour space, since the gamut remains unchanged from the native. You may as well just use a calibrated 'desktop' or 'custom' mode. I also tested the screen at factory setting but in the sRGB preset mode. Thankfully this mode did emulate a smaller colour space, more closely matching the sRGB reference than using the full native gamut of the screen. You can see that the triangle representing the screen does not quite cover all the green shades, and extends a little too far in blue and in red shades in particular. It is common for a screen's basic emulation mode to not accurately cover the reference colour space, but at least this is emulating something smaller than the standard wide gamut. However, when you switch to this preset mode the screen immediately appeared very washed out and overly bright. Colours felt very dull and much less vivid than before. The LaCie report confirms gamma and luminance are no better in this preset mode than before. Colour temperature was even closer to the target at 6454k (1% out). Colour accuracy was still very poor indeed, with average dE of only 8.0, maximum of 14.7. To correct the rather poor default settings some form of calibration will be required. To carry out this initial calibration I switched to the custom color preset mode which affords me access to the full range of RGB controls in the OSD. I followed LaCie's calibration process through, adjusting the OSD settings in line with the recommendations made in the process, and then letting the software carry out the LUT adjustments at a graphics card level and create an ICC profile. The screen does not feature a hardware LUT calibration option so other than the OSD alterations, the rest of the process is carried out at a graphcis card level in profiling the screen. The calibration was a great success all round thankfully. Gamma was now corrected to 2.2 with 0% deviation from our target. Colour temperature was also corrected to 6504k and luminance was now a far more comfortable 121 cd/m2. This gave us a black depth of 0.18 cd/m2 which was ok, but not great. The static contrast ratio of 673:1 was moderate as a result, but not that far out from the U3011's 727:1. Colour accuracy was also improved drastically. From the defaults of 6.5 average / 11.3 maximum, we now had dE at only 0.4 / 1.0. LaCie would consider colour fidelity to be excellent now across the range. The screen did feel much better to the naked eye as well, much less washed out and colours felt even and accurate. With a lower luminance as well, the screen was far more comfortable for prolonged use. Colour gradients showed smooth transitions with only slight gradation in darker tones. There were no visible banding issues thankfully. You can use our settings and calibrated ICC profile on your 3008WFP as well if you want. See our ICC profile database for more information. I also calibrated the screen in the desktop preset which was the factory default for the monitor. You cannot individually control the RGB channels in this mode however so other than the brightness (which was set at 34%) there would be no adjustments to the monitor itself. The rest of the process would make adjustments to the graphics card LUT through profiling. Calibration results were again very good, with all targets met very well. Colour accuracy was pretty much on par with the custom color mode, with average dE of 0.4 again. Black depth was not quite as good in this mode and we had a slightly lower contrast ratio of 635:1. This seemed to be the picture for the other preset modes as well, none of them quite reaching the 673:1 we had seen in the 'custom color' mode. Again, ICC profile available if you want it in our ICC profile database. I carried out the same process in the Adobe RGB preset mode. We had already seen from our earlier tests that this preset didn't actually seem to emulate a smaller colour space at all, and instead retained the monitors native gamut. The newer U-series screens reduced the colour space through this emulation mode quite well, and in fact also came with factory calibrated adjustments in the Adobe RGB and sRGB preset modes for accurate gamma and colours. This offered some pretty decent performance even out of the box on the newer models, but the 3008WFP was lacking this factory calibration. These presets could also be further profiled on the U3011 allowing us to return even better results and more accurate colours. With the 3008WFP gamma, colour temp and luminance were all corrected thankfully. However, despite multiple attempts to correct the colours, we were unable to achieve decent colour accuracy in this preset mode which was disappointing. Colours could be improved compared with the default settings, but colour accuracy was still poor with average dE of 3.4, and maximum of 6.5. Combined with the lack of any emulation of the smaller Adobe RGB colour space, I would say this preset mode seemed largely useless unfortunately. There was a similar story with the sRGB emulation mode unfortunately. Again, this preset is factory calibrated on the U-series screens, but not here on the 3008WFP. This preset did at least emulate a smaller colour space, helping to reduce the native gamut somewhat and emulating the sRGB space as best it could. Again, gamma, colour temp and luminance were all corrected well. Colour accuracy on the other hand remained very poor, and we could not correct this even with multiple attemps. Average dE was only 4.4 and ranged up to 24.6 in the worst case! Colours still felt quite dull and not bright enough which was a shame. If you need to work with a smaller colour space, this preset is your only choice from the 3008WFP, but unfortunately you will not be able to obtain decent colour accuracy it seems. This is a shame, as anyone wanting to work with a standard gamut colour space cannot really do so properly using the 3008WFP. The U3011 would be a far better option if you need to use both wide gamut and sRGB colour spaces properly. I have plotted the results of these tests above compared with some of the popular and competing models we have tested. As you can see the 3008WFP offers some of the worst default colour accuracy we have seen, with an average dE of 6.5. This was unfortunate and certainly not as good as the newer U3011 (1.7). This was also a considerable way behind the NEC PA271W (1.1) but that is of course a professional grade colour enthusiast screen. Of course the NEC PA series also offers other high end features which separate them from some of these other models, including extended internal processing, 3D LUT's and hardware calibration. These comparisons are based on a small selection of tests, so it should be remembered that other factors do come into play when you start talking about professional use. Once calibrated the screens were all quite similar, although the TN Film based 27" VX2739wm was a little behind (0.7). The 3008WFP was a little behind the modern U-series displays but only slightly. 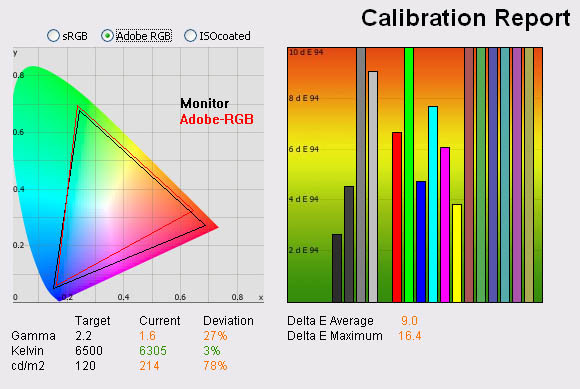 You can correct the issues with the screen through proper calibration and profiling, but this is only possible really in the custom color and desktop modes. As a reminder, the colours could not be properly corrected in the Adobe RGB and sRGB emulation modes. If you need to work with colour spaces outside the native gamut, this could present a problem. The 3008WFP offered a slightly better black depth (0.18) than the U2410 (0.22) which was a decent enough result. It was also on par with the U2711 (0.18), but a little behind the new U3011 (0.16). A couple of the other models such as the NEC EA231WMi and Dell U2311H were slightly ahead again (0.15 and 0.14 respectively). Contrast ratio was average from the 3008WFP at 673:1, again level with the U2711 (672:1) and a reasonable improvement compared with the U2410 (541:1). It was a little behind the U3011 (727:1) and Hazor HZ30Wi (713:1), and a considerably way behind some of the smaller IPS models like the Dell U2311H (857:1) and NEC EA231WMi (767:1). 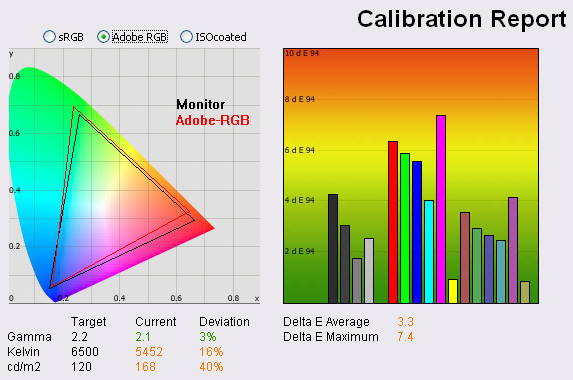 Luminance of the screen was a very high 253 cd/m2 when the screen is set at 100% brightness. This was a fair way off from the maximum specified brightness of 370 cd/m2 though, but probably not a luminance you'd ever need to use in practice. At the bottom end, the screen reached down to 93 cd/m2 when set at 0%. The newer U3011 could only reach down to 128 cd/m2 at 0% which was a bit high really considering most users will want to set the screen at about 120 cd/m2. Thankfully the 3008WFP could reach a little lower. You will probably want a setting of around 30% for a lumincance of ~120 cd/m2. The OSD brightness control did afford a fairly reasonable adjustement range of 160 cd/m2. The Dell 3008WFP features a dynamic contrast ratio (DCR) control, which boasts a spec of 3000:1. By modern standards this is actually quite modest, but then this screen is a fair bit older from the modern generation with DCR's in the millions. The DCR feature can be selected through the OSD when you are in any preset mode which was good. While this mode is in use, you cannot manually adjust the brightness or contrast settings in the OSD without it turning this feature off. The changes are smooth and sublte so are not going to be too obvious to the naked eye as content on the screen changes. The dynamic contrast ratio control worked reasonably well here which is quite rare for the Dell screens we have tested recently. The luminance reached a peak of 257 cd/m2 in the brightest scenes, and down to a decent 0.13 cd/m2 in darkest scenes. This gave us a maximum DCR of 1977:1 which was pretty good. This feature is at least useable on the 3008WFP for those who like the technology. Viewing angles of the 3008WFP were very good. There was minimal contrast shift horizontally and the IPS panel technology exibited wide fields of view in this regard. It was free from the off-centre contrast shift which you see from VA matrices. Vertically there was a slightly more pronounced contrast shift as you moved away from a central point, but the panel was certainly free from the very restrictive viewing angles you see from TN Film based screens. No complaints here in relation to viewing angles. On a black image there was a pretty obvious characteristic H-IPS white glow from an angle as the panel does not use an A-TW polarizer. The uniformity of the panel was not that great sadly. The left hand side of the screen was quite a bit darker than the right, ranging down to 90 cd/m2 (-33% deviance) in the worse case. The top right hand corner of the screen ranged up to 134 cd/m2 (+10.5%) as well. We had seen a similar story from the U3011 which uses a very similar LG.Display panel, although not quite to the same degree here. This was a little less uniform unfortunately with a wider deviation at the extremes. However, like the U3011, ~70% of the screen was within 10% deviance from the 120 cd/m2 target. I tested the screen with various coloured backgrounds including greys and whites to see if there was any sign of colour tinting across the panel. On a light grey background you could just about pick out the luminance difference, with a slightly darker left half of the screen being detectable with close inspection. There was no obvious colour casting across any part of the screen thankfully from our sample. As usual we also tested the screen with an all black image and in a darkened room. A camera was used to capture the result. The uniformity of the backlighting was pretty good in this test. There was some very slight leakage in the corners as you can pick out in the image, but it was not too severe. This was particularly apparent in the top corners of the screen. There was no severe leakage from any edge which was good to see at least. We've reviewed quite a few ultra-high resolution screens recently, from the 27" 2560 x 1440 models (Dell U2711, NEC PA271W) to the 30" 2560 x 1600 Hazro HZ30Wi and Dell U3011. It takes quite a bit of adjustment when you move to a 30" screen as the sheer size of it is quite overwhelming. We tend to use 24" monitors day to day and now they just look tiny next to this monster! The extra screen size and massive 2560 x 1600 resolution really gives you a lot more room to work with though, and you can easily carry out split screen working with multiple applications and windows open. It would be an excellent choice for any multi-tasking applications where you need to split the screen into sections. It's a little bit bigger vertically than the modern 27" screens which have a 16:9 aspect ratio and 2560 x 1440 resolution. The screen has a 0.2505mm pixel pitch as standard for a 30" model. This is a bit smaller than a standard 24" model which is 0.270mm. Text does appear smaller as a result, and personally I find it a little too small for long term office use. It's not as small as some of the new generation of 27" screens with ultra-high 2560 x 1440 resolutions (0.230mm) which is good. Worth trying to see one in action if you are worried at all about font size. This will be a personal taste really. The image was very sharp and crisp and text was very clear using the Dual Link DVI interface. The analogue D-sub interface cannot support the full native resolution of the panel so a comparison of picture quality is not easily made. The decent range of ergonomic adjustments made it easy to get a comfortable position for the screen as you would hope although the maximum height adjustment was not that great. Movements were at least smooth and simple and I liked the design of the cantilever hinge. The preset modes on this model were a little lacking, with no real AdobeRGB emulation possible, and the inability to correct the colours properly in both the Adobee RGB and sRGB modes. It would have been useful if the OSD adjustments for brightness were saved individually for each preset mode as well I think. The added 4x USB ports are useful for connecting external devices and it was good to see two on the left hand edge for quick access. The 9-in-2 card reader is also useful I think and a nice feature which Dell have included for several years now. There's no auto brightness control which I personally think can be useful in changing ambient lighting conditions. The Dell 3008WFP was tested using the chase test in PixPerAn, a good bit of software for trying to quantify differences in real terms responsiveness between monitors. As a reminder, a series of pictures are taken on the highest shutter speed and compared. The images below show the best case example on the left hand side, and the worst case example on the right hand side. This should only be used as a rough guide to comparative responsiveness but is handy as a way of keeping a constant test of each screen. The 3008WFP uses LG.Display's 30" LM300WQ5-STA1 H-IPS panel. This utilises response time compensation (RTC) to boost the response time across grey to grey transitions and the manufacturer quotes the minimum response time for the panel to be 5ms G2G. Dell have re-classified the panel at 8ms G2G according to their specs however. Obviously these are just specs on paper, and real life responsiveness can vary. We have provided the PixPerAn images above alongside 4 other very popular models in the market, all using IPS panel technology. The responsiveness of the 3008WFP in these tests was quite good really. There was no obvious ghost images to the naked eye, but you could detect the motion blur reasonably easily. I have already commented in the U3011 review that I think the responsiveness has improved a little with the newer U3011 model (they have rated that screen at 7ms G2G as well), but only very slightly. I ran the screens side by side and although they were very close, the U3011 did seem to have a slightly sharper image in moving scenes and a less pronounced blur. This was picked up in this test as well and you will see the trial image is a little less obvious on the U3011. The Hazro HZ30Wi (using a slightly different LM300WQ3 panel) was again very comparable to both, being somewhere in between in terms of responsiveness in practice. It was also pleasing to see there was no RTC overshoot evident here which can be a problem on some screens is particularly aggressive or poorly controlled overdrive impulses. This can take the form of dark or pale trailing behind the moving objects, but there were no such issues here. You can spot this on the U2711 for instance in the form of dark artefacts. For comparison I have also put the results from our current reference screen above, the Samsung SM2233RZ. This shows the type of responsiveness that is possible from a modern display. The Dell still performs very well as you can see, but there is still a slight blurred trail even in the best case image, something which is almost none-existant in the Samsung test. The Samsung is also free of the RTC overshoot artefacts, and this is largely due to the use of 120Hz technology which helped eliminate these issues in our tests. As a side note, the screen does feature a dynamic contrast ratio control if you want to use it. Some gamers like this as a feature, some do not so that's down to preference. We've already had a look at the feature which seems to work quite well on the 3008WFP. There is also hardware aspect ratio control available through the OSD with options for fill, maintain aspect ratio and 1:1 pixel mapping. This is actually a slightly more restrictive choice than was available from the U3011 which offered a couple of extra options. 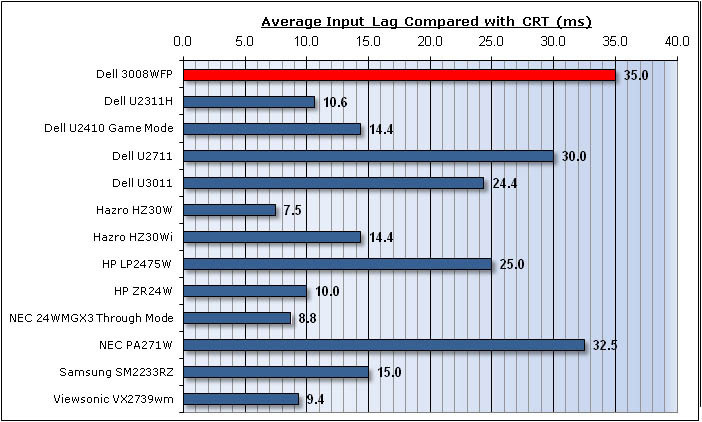 The average input lag of the 3008WFP was fairly high, being a little more than some of the other models we have tested. The average input lag was 35ms, ranging up to 50ms in some circumstances. In comparison, the new U3011 had only 24.4ms lag average, and the Hazro HZ30Wi was even better at 14.4ms. This relates to variations in scalers being used and the Hazro models have always been good in this regards since they often don't use internal scaler chips. The Dell U2711 was 30ms average, while the U2410 was only 14.4ms since it offers a 'through mode' via the game preset which bypasses a lot of the internal electronics. This is designed to reduce input lag specifically, but is not present on the 3008WFP (I did test to see if any difference in the game preset, but there wasn't). Even with a 35ms delay, this is unlikely to cause a massive problem to casual gamers, but those playing FPS games might want to consider alternatives. Fairly good black depth and contrast ratio helping to ensure detail in darker scenes is not lost. Not as good as some of the other models we have tested using IPS technology. Panel uniformity was not brilliant, but there was no noticeable backlight leakage from any edge. That can be distracting in movies, especially where black borders are present, but not a problem here. There was some slight leakage from the corners however which was a shame. Being a Dell UltraSharp screen, there are aspects which we begin to take for granted I think, but should still be mentioned when talking about the 3008WFP. The design, ergonomic adjustments, interface options and features are all extremely impressive. Dell have not held back at all, and it's great to see those extras like HDMI, DisplayPort, USB ports, (a working) dynamic contrast control and a card reader. This is the high standard we have come to expect from a Dell screen, but considering the price is so competitive it's good to see everything is still here. Performance wise, the 3008WFP had some obvious draw-backs when it came to colour accuracy and factory set up. There was no factory calibration on this model, something which should not be under-estimated on the modern U-series screens. Instead, factory settings offered poorly adjusted gamma and inaccurate colours. In the Adobe RGB and sRGB emulation modes, the colours could not be corrected properly in fact. The Adobe RGB "emulation" was also non-existant sadly. Having said that, good results were possible with a colorimeter calibration in the other modes at least. You may need to consider what calibration methods are available to you if you want to purchase this screen however, as you can't rely on accurate out-of-the-box settings sadly. In other areas, pixel responsiveness was pretty decent and input lag was moderate. The luminance uniformity of the panel was not perfect, but not too severe as well, and contrast ratio was fairly good. The newer U3011 model holds some obvious advantages over the 3008WFP I think, but this could still be a decent option if the price is right. At the time of writing, the price difference is only about £100 in favour of the 3008WFP (~£1080 GBP), but over time this could well drop. If you can get a good deal, and are able to calibrate the display to an adequate standard, this could be a good choice in the 30" sector. A dynamic contrast ratio which actually works!